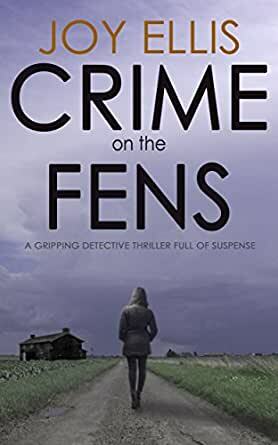 CRIME ON THE FENS is the first novel in a gripping new crime fiction series. This book is a ripper of a start to the DI Nikki Galena series. Unfortunately I read the fourth in the series first - Killer On The Fens - as it was free for me as a "Kindle First" option, then I couldn't help but turn around & read the debut novel as I was mesmerised by the character Nikki and her band of "dysfunctional" cops. Crime on the Fens shows us where Nikki began & how, through one of her past cases and the tragedy that befell her daughter, she finds herself sucked into a whirlpool of hate, vengeance and recriminations. She is thrown a lifeline to keep her job in the form of her new second-in-command DS Joseph Easter , and we see how the pairing of these two is the salve to soothe both their wounds. We meet the motley bunch of her team and each reveals their own secrets as to how they have come to be on her team. Add in a gripping plot and multiple crimes that confuse the team initially and you have a stunning debut novel. I have now downloaded all of this author's works. Thoroughly enjoyable. * I don't give a synopsis of the book - you can read that in the blurb and through professional reviews on Goodreads. I bought this after reading the second in the series Shadow on the Fens which was a compelling well written thriller. I was not disappointed and it was good to find out some of the back stories. Joy Ellis writes very well. The story is part police procedural, part action thriller, and part psychological. As we go through the story each of the characters provide commentary on their feeling and their decisions. It was pretty entertaining and so worthy of the 5 stars. In this book we meet driven and difficult DI Nikki Galena trying to fight the drugs in her Lincolnshire town to avenge her daughter. We meet DS Joe Easter a former soldier who volunteers to work with her because of her success but has a 'goody' reputation. There is obviously some sort of chemistry here and some interesting thoughts. A young girl disappears. At the same time people in masks start committing crimes. Stir into the mix a nasty criminal who blames her for disfiguring injuries. The team is under pressure and events start to spiral. Then their hard work and some intuition start to turn the tide. All in all a good fast moving read. Perhaps the only issue is the value of the criminal activities is a fraction of what is expected and hardly seems worth the trouble. A well written beginning to a great new crimes series. If you like fast moving action while maintaining good investigation procedures and the bonus of finding out what the characters are thinking buy this book and be ready to buy more. This story contains an intriguing and complex plot and great characters. The characters are have interesting personalities and they play against each other nicely. The DI is skimming the edge of the law and has to take on a new DS to save her career. They both only know of each other through police gossip. Each member of the team is not quite what they seem to the police outside their unit. As the case develops we get to see what they are really like and how they pull together. The ‘bad guys’ are evil and show no remorse for anything they do. There are a few moments where I thought that the police were not going to make it out of the situation they were in. I’ve read the DI Jackman series and am now going back to catch up on the Nikki Galena series. I’m looking forward to a strong and exciting series. I love an 'edge of your seat' crime/thriller novel and Crime on the Fens was good. What I liked most about the book was: the character development, particularly, Nikki Galena and Joseph Easter. They were appealingly fallible, while at the same time, strong and intelligent. The next part of the narrative that was a plus was the twist, which is always important in a thriller. However, (and this leads to what I didn't like so much) the climax/conclusion, while unexpected, was a little too quick and underdeveloped. This highlighted some inconsistencies in the pacing, just taking away from what could've been a terrific read - hence the 4 stars. I love to read the English murder mystery genre and love to read the series. I started to read this book thinking, from the reviews, that it would be a good series. Sadly disappointed I did not read past 50% of my kindle edition. DI Nikki Galena was just too much. She was a nasty person and along with a not very interesting plot I could not go on. Apart from Angela Marson's Kin Stone I do not feel that the female detectives need to be so dam nasty. I prefer the guys such as Roy Grace and Nick Dixon. Willmot be reading any further of this series. A great new British Police Detective, DI Nicky Galeno and her team are a breath of fresh air. Can't wait to read the next one in the series. Highly recommended to anybody who enjoys Fry and Cooper series. For a first book,consider the author to be heading towards Booth,Dalton and the rest of the great British Police series writers. At first I wasn't too sure I would like DI Nikki Galena, she seems to be tough and very unpleasant, but as we learn, she has good reason and as the story unfolds with her new sergeant Jospeh Easter she begins to relax, and the real woman begin is revealed. Still hard bitten, and tough, but with a smile and an encouraging word for her colleagues, she grows on you. Joh Ellis's description of the Fens is sheer magic and I could wish I didn't live so far away on the other side of the world. I'm delighted this is the first book in a new series, which means I have hours of pleasant reading ahead of me.